Imagine the thrill of being pulled by a team of 10 Alaskan huskies through snow covered trails as you sit back and feel the sound of whooooosh behind you. While once a way of carrying food, supplies and even U.S. mail across snow-covered terrain, dog sledding has become a popular recreational adventure. Depending on your idea of excitement, there are many ways to experience this sport — from simply being a passenger in a sled to driving your own team of Huskies to overnight camping. If you’d like to go on a multi-day trip, you can opt to stay in a lodge or camp out in a yurt — a heated Mongolian shelter. And, of course, watching dog sled racing is always great fun. 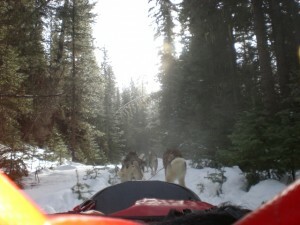 For a traditional ride, passengers sit in a bobcat-type sled, covered in fur pelts and zipped up in plastic lining to protect against the wind as they glide through white, pristine wilderness. Up to five people can sit in the dog sled with a trail typically around 11 miles and up, lasting around an hour. How fast do the dogs go? “About 40 paws an hour,” joked Ulsamer. When the dogs are connected to the line and ready to go, the musher stands behind the sled and calls out different commands to the dogs that are not harnessed, but simply attached to the line. “Gee” means go right, while “haw” tells the dogs to go left. The term “mush” is never used because it’s too soft of a sound. And then, the dogs take off! 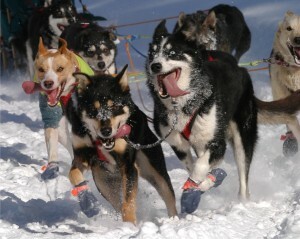 Riders feel total exhilaration as their team of Huskies pulls them along the trail. You feel a sense of wonder being at one with nature. While the cool air comes rushing at you, you watch the changing terrain, sit back, relax and enjoy the ride. Part of the total experience is interacting with the dogs before and after the run. Most of the dog sled adventures include an opportunity to see, pet and yes, even hug a Husky! After the run, the dogs get to drink some warm soup and the riders get to play with them. Dog sled adventures range from $90 and up. 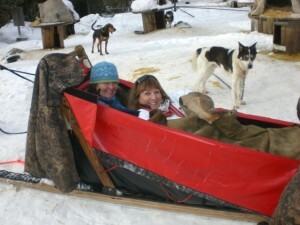 More information on Dog Sled Adventures or call Dog Sled Adventures Montana, 406-881-2275.